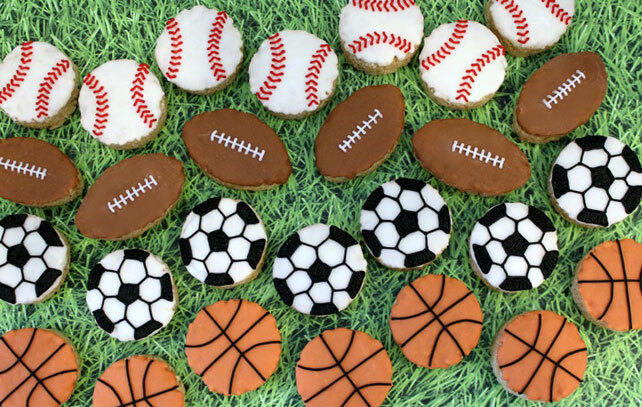 Score big with these fun crispy treats decorated as sport balls. Perfect for sport events and themed birthday parties! Measure 8 cups of crispy cereal into large mixing bowl and set aside. Pour mixture over the crispy cereal; stir until well coated. Using buttered spatula or wax paper evenly press mixture bottom of 9" x 13” pan coated with cooking spray. Refrigerate for 30 minutes. Remove from refrigerator and slide the entire crispy treat out of the pan. Cut out 21 round and 7 oval shapes with cookie cutters. Press remaining crispy cereal scraps together and cut more shapes if needed. Melt half of the white chocolate chips in microwave-safe bowl, at half power. Stir every 30 second until smooth. Dip the tops of 14 round balls (7 baseball and 7 soccer balls) into the melted white chocolate. Spread with spatula if needed to make sure the entire top is covered. Set aside on a piece of wax paper to harden. Add half of the remaining white chocolate chips to the same bowl and melt as instructed above. Add a few drops of orange and a tiny bit of brown candy color for the basketball treats. Make sure you use candy coloring, not food coloring as food coloring will seize the chocolate. Add the rest of the white chocolate chips to the orange-colored chocolate. Melt as instructed above. Add brown candy color for the football treats. Dip the oval shaped crispy treats into the melted chocolate. To decorate the tops of the sport balls, you’ll need white, black and red frosting. Fill three plastic zip-top bags one each with red, white and black frosting. Using kitchen shears, snip off a tiny piece of one bottom corner of the bag. For the baseball, gently squeeze white frosting to pipe the two white curves on each side of the ball. Next, pipe small red V shapes over the white frosting curves for the stitching. For the football, pipe one long horizontal white stripe on the middle of the ball. Pipe eight tiny stripes vertically over the top of the center stripe. For the basketball, pipe one horizontal black stripe across middle of the ball and one vertical stripe across creating a cross. Pipe black curves to each side of the vertical stripe. For the soccer ball, pipe a small pentagon shape with black frosting in the middle of the ball and fill it in. Pipe a spoke of equal length from each corner of the pentagon. Next, drawing the tip of a triangle at the end of each of those spokes. Fill the "sneak" pentagons along the edge with black frosting.